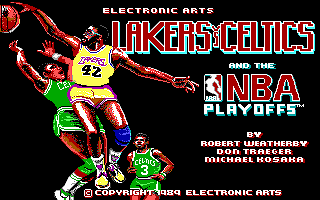 Lakers vs Celtics and the NBA Playoffs is published by Electronics Arts in 1989. 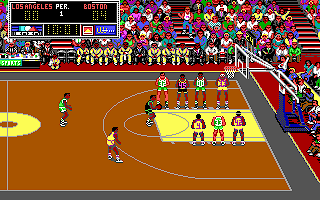 It is a basketball simulation game based on the actual NBA teams and player in year 1989. 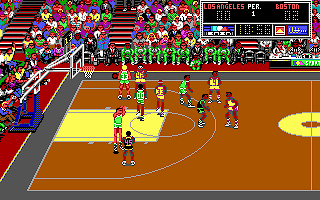 NBA Playoffs supports up to 16-color EGA graphics, but uses PC Speaker only. The graphics and animations is good, accurately simulate various basketball acts, like blocking, shooting and slam dunk. 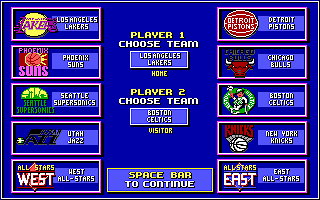 There are 10 teams that we can select in NBA Playoffs: Los Angeles Lakers, Phoenix Suns, Seattle Supersonics, Utah Jazz, West All-Stars, Detroit Pistons, Chicago Bulls, Boston Celtics, New York Knicks and East All-Stars. NBA Playoffs offers two gameplay mode, Single and Tournament. Before every match, there is a Player Stats screen that allow us to switch players and see their state. Actual name are used, except that we cannot find Jordan here. The gameplay of NBA Playoffs is quite fun to play with. All rules of NBA are followed strictly, and thus give us a very realistic feel. If you like basketball, NBA Playoffs is a nice game that you should not miss. 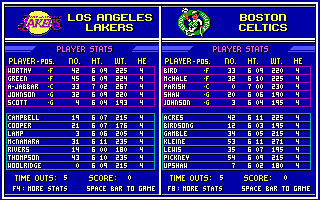 You can download Lakers vs Celtics and the NBA Playoffs here.